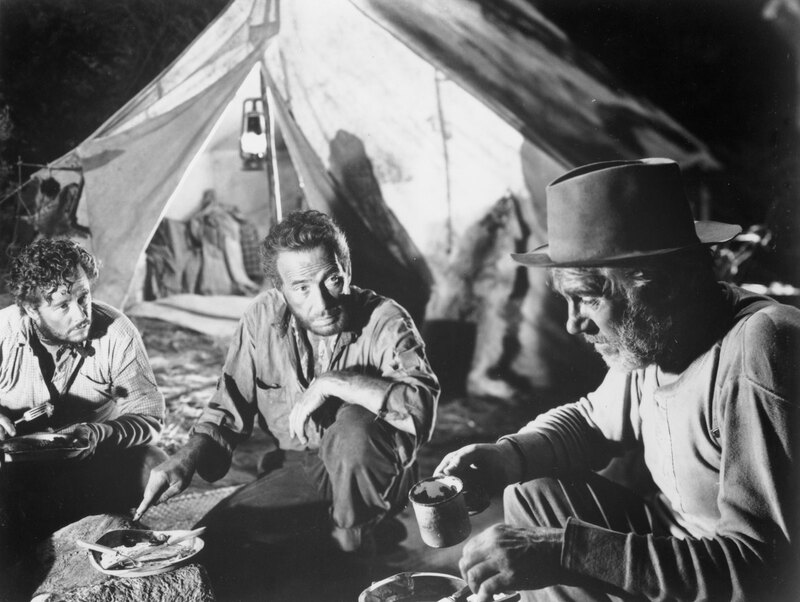 A classic tale of greed and the influence of sudden great wealth on those ill-equipped to handle it, The Treasure Of The Sierra Madre is a marvellous achievement. Director John Huston crafts an epic exploration of human nature, Humphrey Bogart is spellbinding in a transformational performance, and Walter Huston, lovingly directed by his son, delivers a career-defining performance. Dobbs (Bogart) is an American drifter, scratching out a living in a small Mexican town in the 1920s. 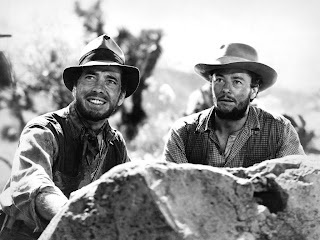 He meets Curtin (Tim Holt), a younger American in much the same situation. The two men appear to meet some good fortune when they are hired for a few days of well-paid labour by the businessman McCormick, but he cheats them out of their wages. Reduced to sleeping in a shelter, Dobbs and Curtin meet Howard (Walter Huston), a grizzled gold prospector who has found and lost several fortunes. His talk of heading to the hills and striking gold strikes a chord. Dobbs and Curtin catch up with McCormick, force him to pay them their wages, and pool their resources with Howard to buy the necessary supplies and the three men head off on a prospecting adventure. As the remote, unexplored terrain gets harder, the older Howard is in his element, and the younger but inexperienced Dobbs and Curtin struggle to keep up. Eventually, Howard hits the bulls eye, and leads them to a rich deposit of gold deep in the mountains. As soon as they start mining the gold, Dobbs' real personality emerges, causing deep divisions and mistrust. The three men paper over the tensions among them and keep on mining. A fourth American prospector, Cody (Bruce Bennett), shows up uninvited and offers to help extract the gold in exchange for a slice of the treasure; but trouble in the form of Mexican bandits is not far behind. Huston directed and wrote the screenplay, based on the book of the same name by the mysterious B. Traven. 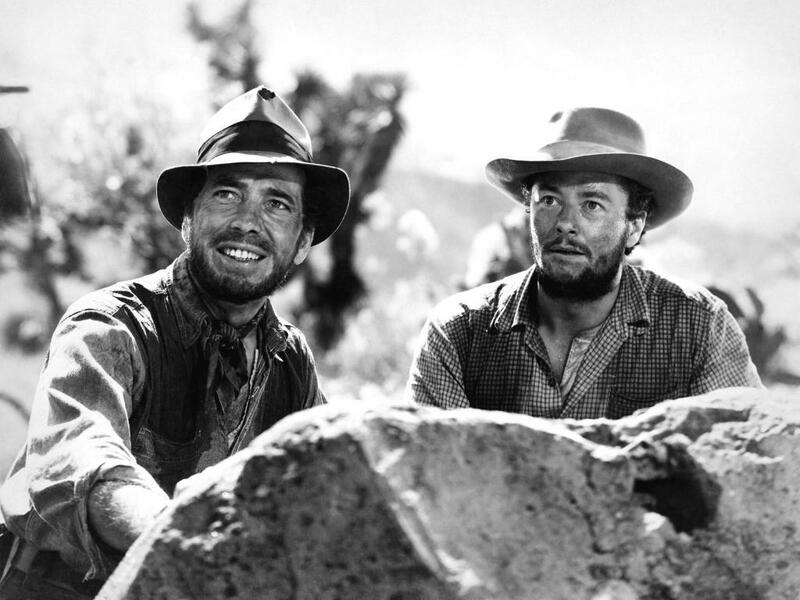 The narrative of the film cleverly moves Howard, Dobbs, and Curtin to their chosen destinies, although they will not arrive at their destinations by the path that they selected: the treasure of the Sierra Madre proves to be a passageway but not an objective. Howard, of course, knows this already, and whether he is rich or not makes no difference to him, although in this case the chase for gold will help him arrive to a restful retirement. It's a different story for Dobbs and Curtin, who are new at the prospecting game: they will both discover for the first time who they really are, as the gold accelerates their rush to meet their true destinies. Huston composes every frame with artistic flare, finding camera angles that contribute to the story telling and add to the growing tension. The initial scenes of interaction between Dobbs, Curtin and Howard are brilliant examples of a master director's unobtrusive hand: Dobbs and Curtin and always in the frame together, facing Howard: he is the third point of the triangle, the catalyst who will help them understand their true selves. Humphrey Bogart is captivating as he embarks on a dark descent into Dobbs' soul. Bogart keeps Dobbs' anxieties well hidden until the discovery of the gold, then expertly and gradually delves into the corners of the psyche where self-destructive evil thoughts are harboured. Bogart leads Dobbs to his appropriate fate in one of his most complex and satisfying screen roles. Walter Huston as Howard is the heart of the movie, an old man who has long since learned the impact of gold on weak personalities. Huston conveys the thrill of looking for and finding treasure; for Howard, what happens afterwards is a lot less entertaining, and he is just as happy losing a fortune in order to start the process of finding the next one. Tim Holt, who spent most of his career in western movies, plays an earnest Curtin, and emerges as the perfect counterbalance to Bogart's Dobbs. Younger and less saddled with life's disappointments, Curtin is the innocent subject of Dobbs' growing lack of trust that deforms into violence. Curtin has to first find and then hold onto his principles, and the gold adventure leads him to his dream but along a most convoluted path. The ultimate lesson of The Treasure Of The Sierra Madre is that gold does not glitter for everyone, and individual decisions are much more powerful in influencing life's progress than a pocketful of treasure.